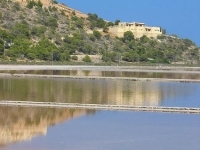 One of Ibiza's famous landmarks are its salt flats, La Salinas, close to the airport on the southern-most tip of the island. The saltpans have been in use for more than 2,000 years, since the earliest colonists, the Carthaginians, traded with the 'white gold' left in the pans when water evaporates in the hot summer months. The sparkling salt lakes provide one of the world's most beautiful sunset photograph opportunities, and the saltpans are a wonderful destination for bird watchers. The famous Las Salinas beach, on the southern tip of Ibiza, is named for the saltpans, and attracts a glittering crowd of sun worshippers and party animals, including many celebrities. It is one of the most fashionable haunts for the wealthy and beautiful in the world! The sea is particularly salty, giving swimmers some extra buoyancy. There are numerous beach bars to try out. The salt flats can be found in the nature reserve that surrounds this gorgeous beach, along with pine forests, sand dunes and a general abundance of natural beauty. It is possible to just stroll into the woods from the beach, but there are also many tours to the saltpans from various towns on Ibiza.